Looking for that perfect image for your website? Search the Free from One.com stock photos directly from inside Website Builder. 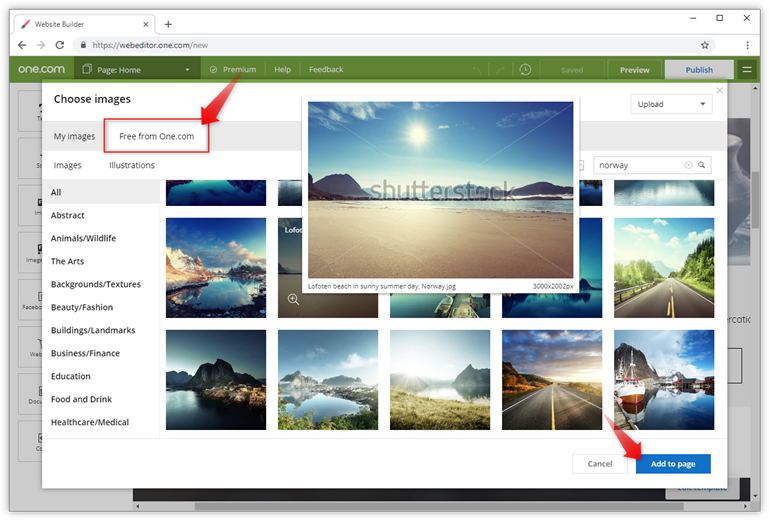 Standard Website Builder users can add 3 pictures for free, while Premium users can add as many as they want. Drag or select an image, gallery or slider component in your workspace. Click Free from One.com in the window that opens. Choose a category or search on keywords to limit your search. Select the image or illustration that you like and click Add to page. The image will be inserted in your site. It will also become available under My images. How do I add multiple images in a grid? How do I add an image to my Website Builder site?